In the late sixties a motorway was planned as an extension to the A40, London to Oxford Road. The plan was that it would be a three-lane elevated road beginning at White City and cutting a swathe through North Kensington and Paddington to join up with the Marylebone Road and then on into the City. There were also plans to have a spur road from the motorway going North to join up with the M1. This road would cut right through the St. Quintin Estate. 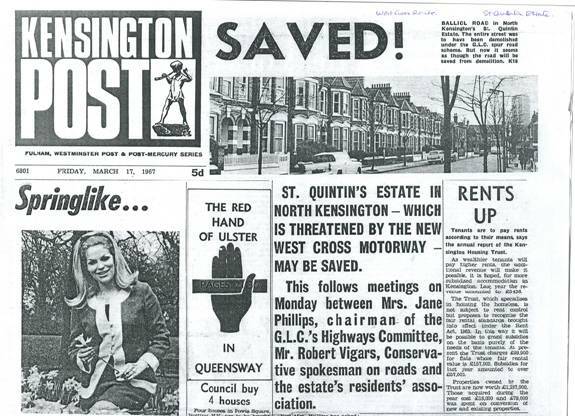 There was great opposition to the destruction of properties in order to prepare for the building of the new highways, from residents who would lose their homes, from those people who would find themselves living almost underneath it and others who felt it would destroy the local areas. The proposed building of the spur road caused consternation on the St. Quintin Estate and a Residents’ Association was formed. Many meetings were held, mainly in St. Helen’s Church, as far as I remember. The thought that this attractive estate was to be carved up was anathema to all its residents but the building continued apace. At last, there was an announcement that the route of the spur road would not go through the St. Quintin Estate but would go along the side of the railway that runs behind Latimer Road. This was a victory and a great relief for the Residents’ Association. Later the plan for a northerly spur road was abandoned completely. However the foundations for it had been laid and can still be seen today on the roundabout when joining the motorway from Wood Lane. Subsequently, as a result of the endeavours of the residents in fighting the battle, the Kensington and Chelsea Borough Council realised that the St. Quintin Estate was worthy of preservation as a typical Edwardian Estate and is now an area of Conservation. This entry was posted in Before the Westway, St Quintin Park, Uncategorized and tagged Latimer Road, St Helen's, St Quintin Estate, Westcross. Bookmark the permalink.